The establishment of parcel post in 1913 had a tremendously stimulating effect on the national economy; it opened a world of opportunities for both farmers and merchants alike. Rural Americans were able to purchase foodstuffs, medicines, dry goods and other commodities not readily available to them previously. 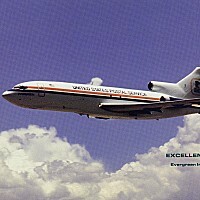 Even more conveniently, the goods were mailed directly to their homes. In addition, farmers were able to ship eggs and other produce directly to the consumer, saving both time and money. Miami, FL: Postal Publications, 1979. Berne, Switzerland: Bureau International de l’Union, 1949. The term “parcel post” refers to the sending of packages through the mail service. In 1878, the Congress of the Universal Postal Union established an international parcel post system. Four years later, the British parliament approved a bill implementing domestic, colonial and foreign parcel post services. Other countries quickly followed suit. The US Post Office Department agreed to deliver parcels sent into the country but refused to institute a domestic service. 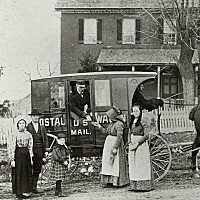 In the late 1800’s, the National Grange and similar organizations concerned with farmers’ welfare lobbied Congress for the free delivery of mail to rural households. Many rural residents had to travel for days to retrieve their mail from distant post offices or pay private express companies for delivery. 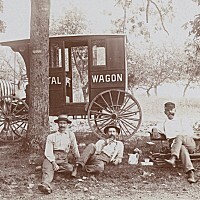 Finally, in October 1896, Congress approved the establishment of rural free delivery. It was a heady taste of life for rural Americans and soon increased the demand for delivery of packages containing foodstuffs, dry goods, drugs, tobacco and other commodities not easily available to farmers. 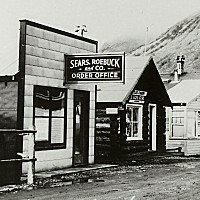 Private express companies and rural retail merchants fought tenaciously against parcel post but rural residents comprised 54 percent of the country’s population and they were equally vociferous. While the question was still being debated in Congress, one of the major express companies declared a large stockholder dividend. 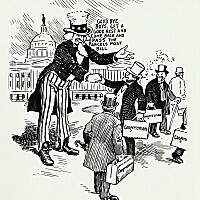 Public indignation at the exorbitant profits spurred Congress to resolve the issue quickly. 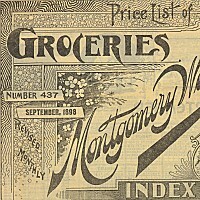 Montgomery Ward, the first mail-order house, started with a one-page catalog in 1872. With the advent of parcel post, the mail-order catalog became the one of the most important books in the farmhouse, second only to the Bible. In fact, the catalog was often called “The Homesteaders Bible” or the “Wish Book”. 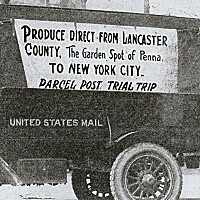 A large fleet of trucks started delivering parcel post shipments in 1918. Farmers were then able to ship eggs and other produce directly to the customer. 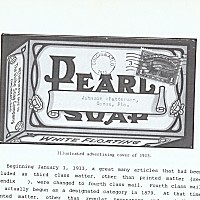 Eggs quickly became a mainstay of parcel post. In fact, six eggs were the first objects sent by parcel post from St. Louis, Missouri to Edwardsville, Illinois. Mailed at noon, the eggs returned to St. Louis seven hours later, baked in a cake. A staggering variety of goods was mailed by parcel post through the years. 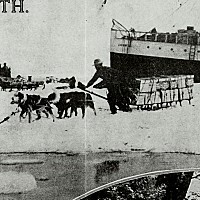 Small animals that did not require food or water while in transit were accepted as parcel post. 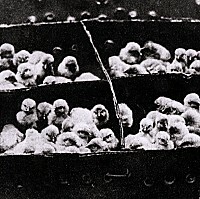 Baby chicks – disliked by carriers because of their noise, smell and tendency to expire en route – were shipped via parcel post in specially constructed boxes. Prior to World War I, before the practice was banned, even children were sent parcel post. In 1914, the parents of a blonde four-year-old named May Pierstroff sent her from Grangeville, Idaho to her grandparents in another part of the state for 53 cents, the going rate for chickens. Word of her excursion quickly prompted the Post Office Department to forbid sending any human being by mail. In 1916, an entire bank – probably the largest and heaviest object ever sent by parcel post – was dismantled and shipped from Salt Lake City, Utah to Vernal, California. Its more than 80,000 bricks were mailed in 50-pound lots, one ton at a time. While the shipments saved the cost of wagon freight, they caused untold misery for local postmasters and railroad workers. Too late to stop the shipment, the Postmaster General decreed that henceforth a single shipper could post no more than 200 pounds a day. Some postal customers have entrusted treasured belongings to parcel post. 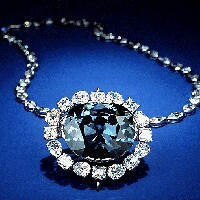 Jeweler Harry Winston mailed the world-famous Hope diamond from New York City to the Smithsonian Institution in Washington, DC in an ordinary brown package. The diamond was insured for $1 million. Shortly before World War I, the United States Post Office Department issued a special series of twelve parcel post stamps. Their depiction of the mail handling operations of the time is highly unusual. However, the stamps were always less of a help than a hindrance. All twelve stamps were of similar shade and design, with similar frames and lettering around central vignettes. 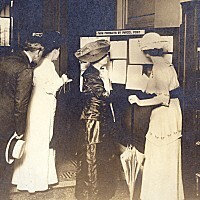 Postal clerks found it difficult to readily distinguish denominations. 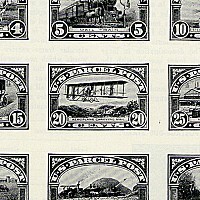 For example, the one cent and one dollar stamp differ only in the word “cent” or “dollar” between the big numerals at the bottom. 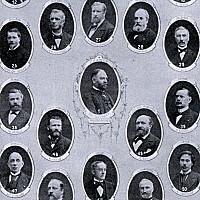 Consequently, the issue of twelve stamps lasted less than a year. For the collector interested in postal history, the four low values provide especially interesting flashbacks. The one-cent stamp shows a postal clerk sorting mail in front of a vast array of mailbags suspended from a semi-circular frame. 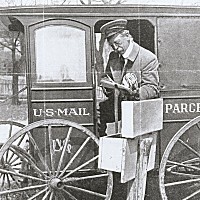 The two-cent stamp shows a city carrier with his hands full of bundled letters and a pouch full of mail. Either this was a particularly busy day or the carrier was on a route with few relay boxes to permit him to carry a more reasonable quantity of mail. The three-cent stamps shows a postman aboard a moving mail car as he retrieves a full sack of mail picked up “on the fly” by the catcher arm. The most archaic scene in this group is on the four-cent stamp with its horse-drawn rural carrier. Perhaps the most interesting stamp of the series is the twenty-cent airmail stamp, which shows a primitive bi-plane not too far evolved from the original Wright flyer!